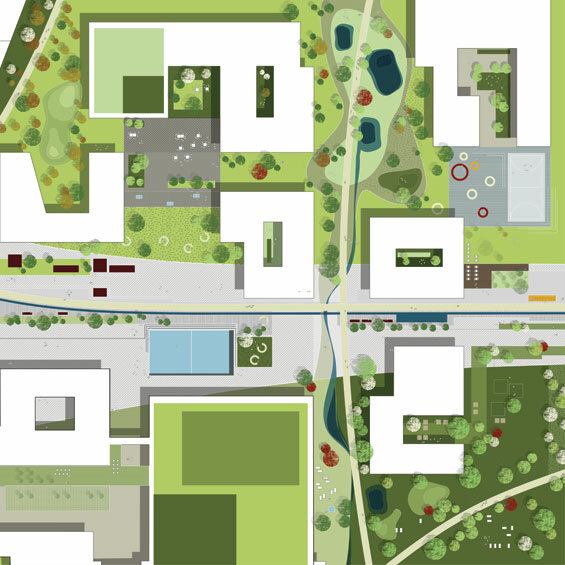 Glostrup, Ejby Urban Pocket, was a parallel competition about the transformation of Ejby business area into an modern and live full urban pocket. 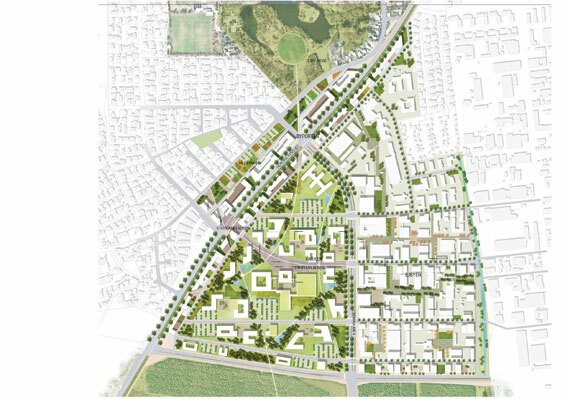 The competition was part of the Realdania initiative “Future Suburbs”, which aims to create debate and visions for the future sustainable development of suburbs in Denmark. 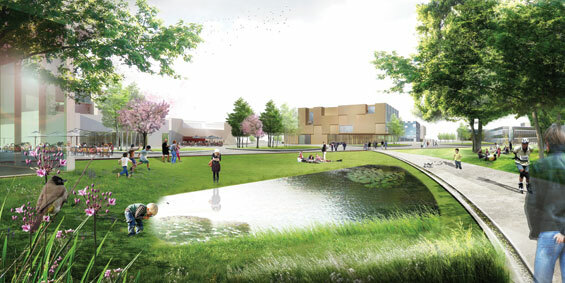 The winning proposal “Ejby Campus” describes the vision of creating a generous green environment and the intention to promote the widely accessibility and a divers use of them. The word Campus is Latin and means open field and the typology is primarily known from the British and American educational environments. As an identity The Campus holds the undisputed quality, of a well-balanced relationship between natural landscape and buildings. In Ejby Campus it is in the open green space that synergy and activities occurs and where people and companies can meet. Three sub-regions with distinctly different qualities characterize the development plan, “The City Gate”, The Park” and “Ejbyen”. These three parts each represent specific potentials, there are to be found, in the current, rather complex character of the area. By perceiving Ejby Campus as one unit, composed of different areas with diverse characters, which include a wide range of activities, the municipality and the land owners will have to approach the different areas with specific tools. On the northern tip of Glostrup municipal boundary the City Gate is located. Thereby, it not only act as Ejby Campus face out, it also represents the entrance to the municipality. It is a traffic hub, with a future light rail station, traffic, bike routes, and pedestrian path links into the area and the surroundings. 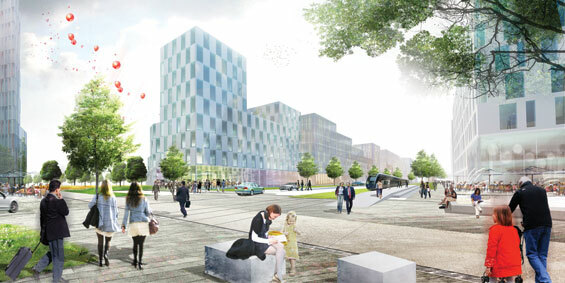 The competition proposal response to this center of importance is a dense and urban corridor along Nordre Ring Road, which serves as an important beacon for the area’s new identity. A part of the dynamic that gives the gate its urbanity, are based on attracting the residents from single-family area. This is achieved partly by establishing practical daily features such as convenience stores and light rail station. To ensure stays and live in the area, a wide buffer zone is introduced, meeting with the residential area, and creating a ribbon-shaped area, mixing practical functions with active and leisure functions. As an urban “buffer zone” the area act as both parking and delivery to offices and shops and as a active qualitative open space, where locals and employees can interact and relax. 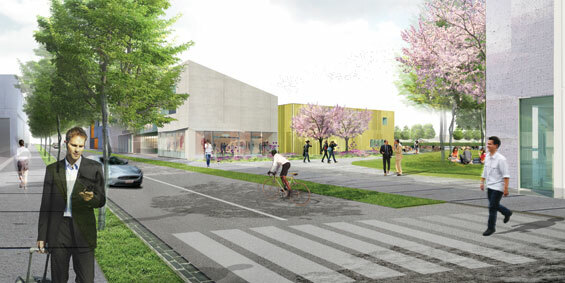 Due to its central location in the heart of the area, the park materializes Ejby Campus green identity. Large, free-standing and distinctive buildings are located in a distinctive and varied landscape and appear as an almost archetypal image on Campus concept. 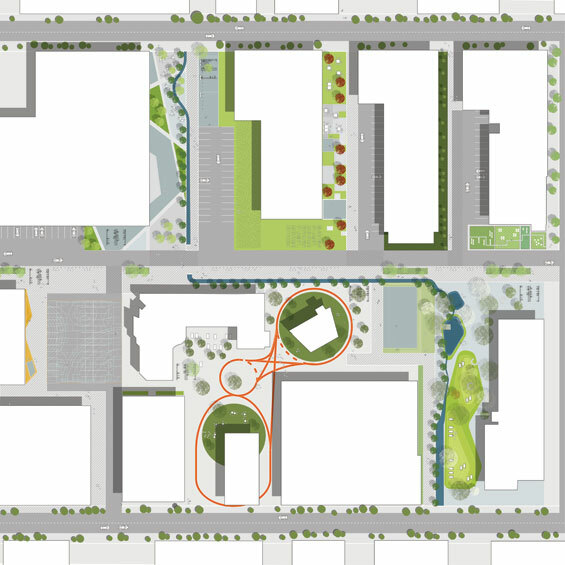 The park’s diverse character of spaces provides opportunities for both privacy and relaxation, but can also accommodate larger activities and social and cultural events. Channels are a significant element throughout the park, through which water flows. In selected areas the rainwater are collected in small basins, that contribute to a visually rich and alluring element, but which also includes an entertainment effect, especially for children. Planting of the area is an essential part of the development strategy, to ensure that, when the light rail are constructed and the transformation of Ejby Business into Ejby Campus are to begin, the park offers a varied and attractive nature, the new investors can build in. Ejbyen offers with its varied and flexible framework an attractive business environment for small, medium and large businesses. The charming and complex character are enhanced by a densification of particular the existing vacant land areas facing the road, which creates a fine matrix of inner road- and walking systems. In return for the densification on the street side a number of coherent space are created on the “backside” which serves as common area, used for parking, relaxation and lunch. 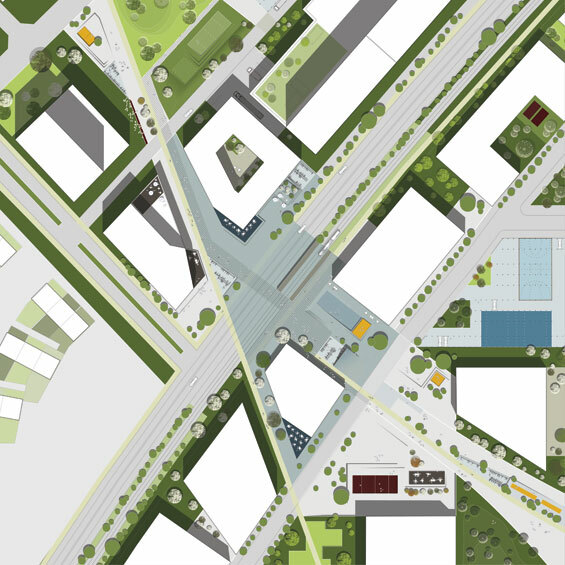 These fields are tied to the existing road network with a network of lateral connections, which ensure the businesses more surface exposure, and secondly, creates a more well-connected, dense and city-like structure.